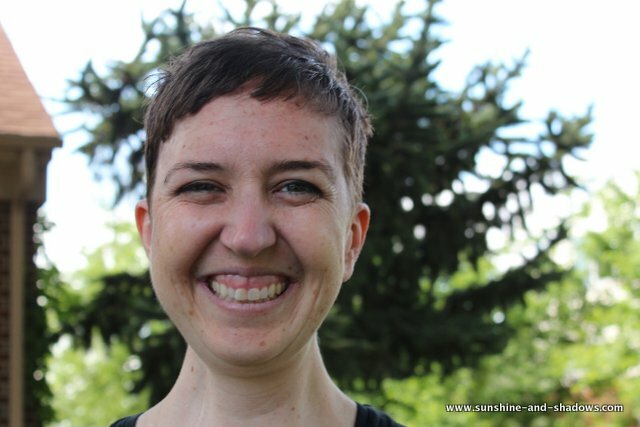 Since my hair is going to fall out any day now, I knew I needed to cut my hair before it all fell out in earnest. I would so much rather pull out little short chunks than big long pieces. Yuck! Plus, then I could keep my hair to make a wig out of it! So the wonderful Eileen came over yesterday morning to give my hair the works. Emmie was having a REALLY hard time with the thought of me losing my hair, much harder than anything else we’ve talked about, even my dying. I was a little nervous about how it would go down today, but thankfully it went really well. 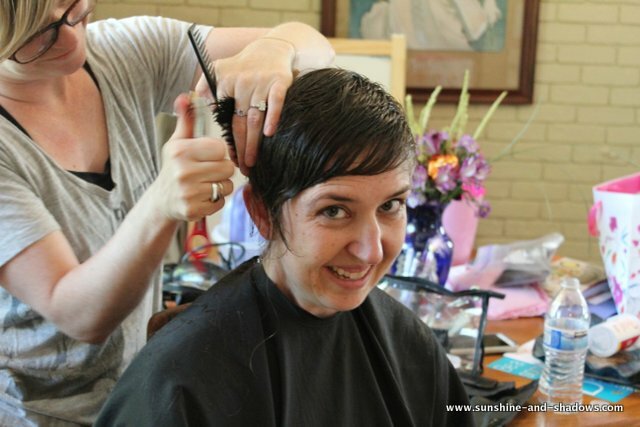 Eileen was amazing with her (she has two little boys of her own), and even let Emmie cut off one of my ponytails! Emmie really liked that part, haha. In other fun news, my awesome friend Jill set up a “bucket list” item for me. I wanted to try on pretty, fluffy dresses, and what’s the best way to do that? 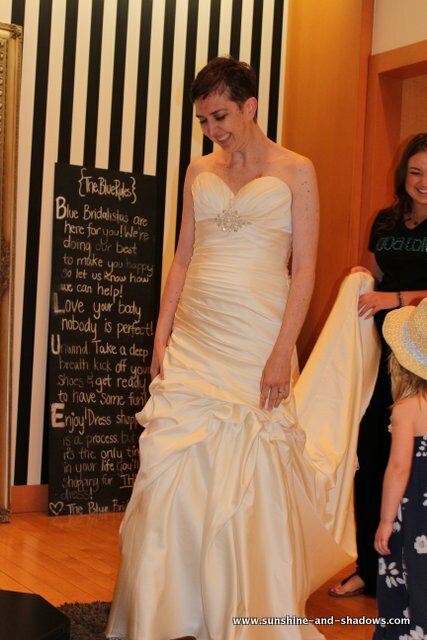 Try on wedding dresses! 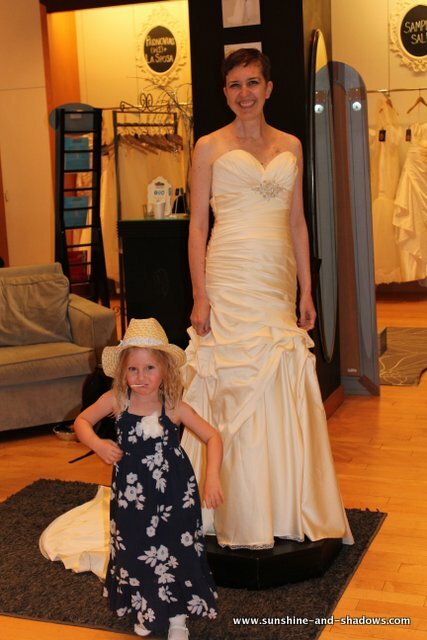 So Jill, Arwen, my mom, Emmie and I went to this truly wonderful bridal shop in Denver to try on lovely dresses. Blue Bridal Boutique was AMAZING. Like, I truly wish that I had known about it slash lived in Denver-area when I got married 10 years ago (TEN years in August! Can you believe it?). 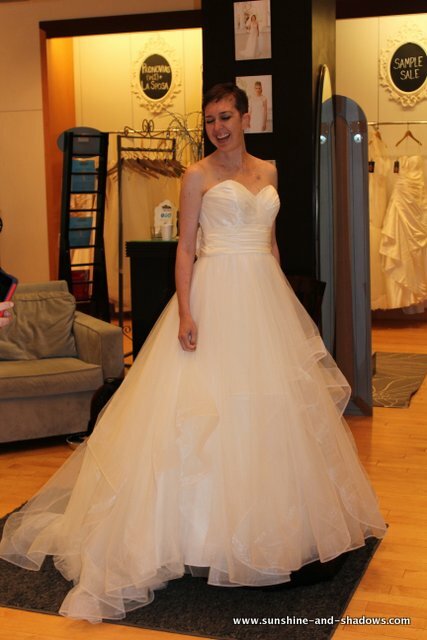 Anyway, if anyone reading this is looking for a wedding dress, seriously head there. 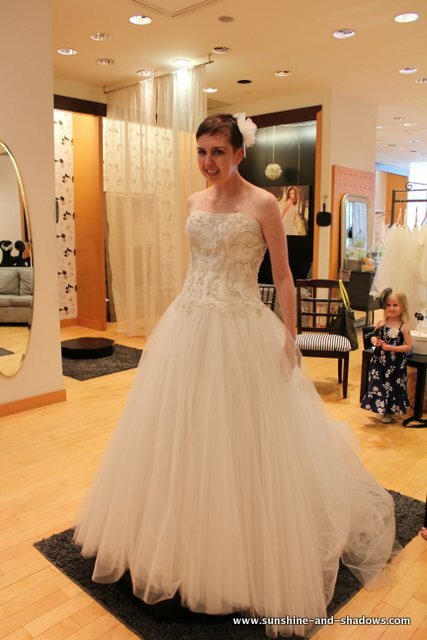 They had a ton of stunning gowns for crazy low prices. Low enough that I was tempted to buy one just for fun, haha! (kidding not kidding). But seriously, I was so impressed with every aspect, even though they knew I wasn’t going to buy a thing. Maybe a vow renewal for our 10 year anniversary in August? Haha! Emmie had a ton of fun too. She is going to be a flower girl in my brother’s wedding later this summer, so she had fun pretending and “practicing” walking down the “aisle” slowly. She liked picking out what I should wear, and she even got in on some of the bling action. 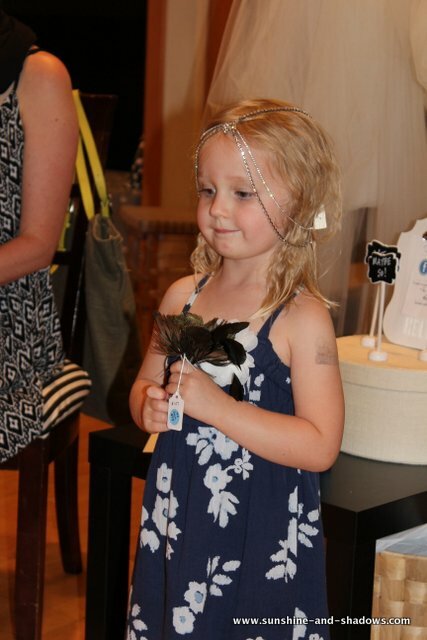 I can’t wait for her to be areal flower girl in August! I hope she does just as well for the real thing as she did in practice. Hooray for fun times and for things being less awful than they could have been. At this rate, I’m feeling pretty good about the hair falling out totally. Many of my friends have given me some beautiful scarves, and I’ll probably pick up some new cute hats too. It’ll grow back in about 4 months, so my Halloween I should have some pretty scary little fuzz going on! I will just keep the faith that my meds will keep working for as long as possible so that I can make it until then and maybe even longer. Only time will tell, but for now, I’ll just make the most of it! I love the pixie cut! You are rockin it! I cut my dreadlocks one time.. I couldn’t bear to throw them away.. so I held on to them.. and got them sewn in.. anything is possible! Wow.. 10 years?? Shannon.. you are officially a OML (Old Married Lady) Renewing vows is a awesome idea!.. 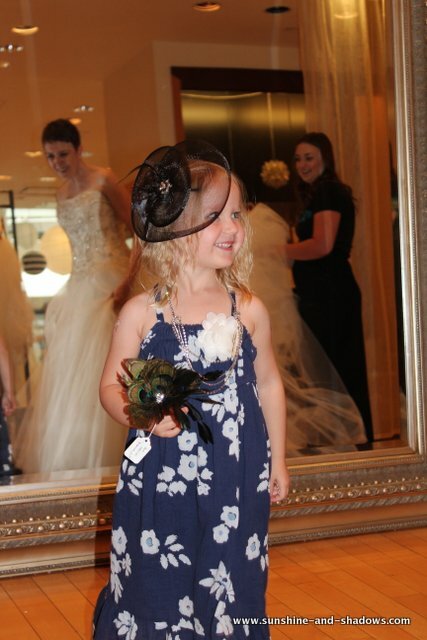 and the gowns.. you look AWESOME .. And we can’t forget Little Miss Diva! She is too cute! 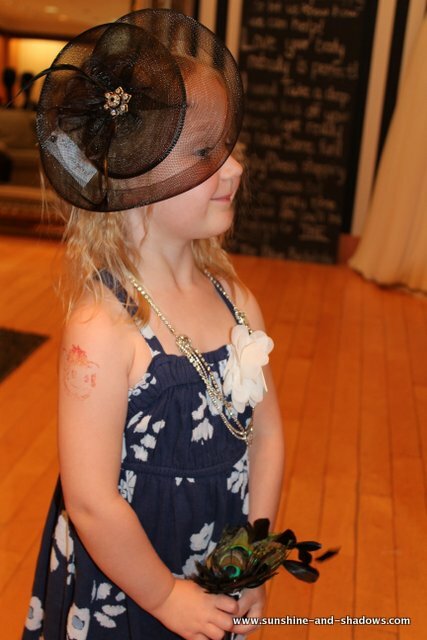 ..I’m loving the hats Emmie is modeling!.. I look forward to seeing pics of you with Orange spikes for Halloween!.. Ahh.. what wonderful fun! Love, love, love the pictures–and especially the smiles. Just beautiful. What can I say! Eileen your so awesome, and the photos and emotions are all over me. Shan, Uncle Bill gives you all my love and we will look forward to this wedding so much! Can’t tell you! …LOVE YOU ALL! You seriously rocked those dresses!! 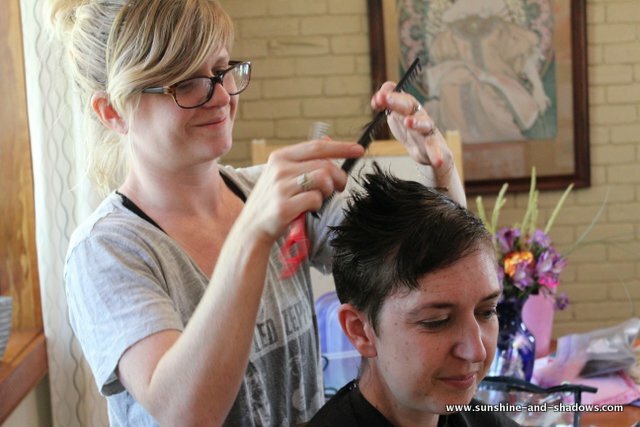 The hair do, the make-up, the dresses…everything – just seriously awesome. You’re so statuesque and gorgeous, girlfriend! !